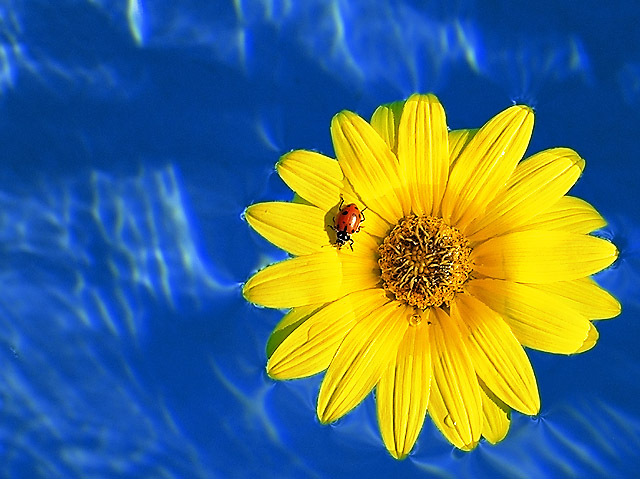 Ladybug floating on a flower in the pool. What an amazing contrast. This really makes an impression on me, mostly because of the pure colours. Wow! I love this. It's one of my favorite photographs ever. I can't understand how it only got third place. The dragonfly picture is pretty nice, as is the bee pic, but this is so much more beautiful that it's not even fair. Congratulations on your ribbon. The lighting in this pic is perfect. This really is a very pretty photo you got. The composition is exordinary, the colors are magnificent and the focus is really good. You really did deserve a ribbon, well done and congrats. Love the colors, striking and beautiful! Talk about composition perfection. You should add 'MOC' to your professional title. Tom Helsel, Master of Composition. Another beautiful shot for your portfolio. Message edited by author 2003-09-16 14:02:59.
what a great shot. very pleasing to the eye. great detail - tips of the petals in the water, the water drops on the flower, etc. nice work. Nicely done, the colors pop! Awesome colours, great contrast. Bug almost secondary to the shot unless it was red so makes a great detail. Great composition. The blueness of the water really sets the flower apart and the color of the ladybug really sets itself apart from the flower. These three layers give it a great depth of field. An incredibly beautiful shot. It would make for a great summer greeting card or a postcard. Congratulations Tom. A clean, clear attractive shot. Congratulations Tom on a great photo and also your first ribbon. Message edited by author 2003-09-15 01:31:45. Really delightful shot! Congrats on the ribbon! It won't be your last! Congrats..This photo almost feels 3-d. I feel like the flower is moving in the water. Beautiful colors! This is very nice - great colours and composition. I think this will do well - a very attractive shot. Well done. Absolutely gorgeous! The colors are so beautiful and stunning! Wonderful contrast of colors......excellent! Unique perspective. I really like this and the more I look at it the better I like it. Great composition and absolutely wonderful color. Very nice colors on this one. Great use of color and composition. Great job. The only (minor) distraction is the highlight on the bug itself. Otherwise a perfect shot. By far my favourite. A guaranteed ribbon in my book. Excellent image and great use of colors! I like how this is not just a picture of some random insect, but photographer has put some thought into it and makes it more interesting! This is a terrific composition! I love it. The blue and yellow contrast with the ladybug is outstanding. Well done. Wonderful idea and great use of contrasting color. Good composition as well. I like your idea, it is a creative take on the challenge. Good title too, I like the way the light hits the water and the delicate way the petals of the flower 'break thru the water'. Fantastic color combination. The texture in the water is awesome and everything is sharp and focused. Congrats on a beautiful pic. Pretty and a cute idea. I love this photo! The color contrast between the flower and the water is great. The composition is good and it's original. 10 Good luck. Unique idea and great color mix... Nice picture! Great colors...just stunning blue and yellow. great simple colors, but get in closer! Colors are absolutely fabulous. 10. Great composition, lighting & clarity! Terrific job! Proudly hosted by Sargasso Networks. Current Server Time: 04/18/2019 11:19:53 PM EDT.